There are many ways at St. John the Evangelist to give back to the church and community, whether financially, spiritually, or gifts of time and talents. All gifts contribute meaningfully to our lives of faith and service, and each performs a vital role in helping St. John’s to serve and support our growing parish. Please consider serving as a lay leader; organizing coffee hour; making meals for others; serving as a greeter on Sunday mornings; lending a hand at our Sunday receptions; helping to change light bulbs, or even flower bulbs! Your presence, and your contributions – big, small and in between – are always welcome at St. John’s. • General help: Have a special skill to share, or time to help? Please contact Fr. Humphrey at [email protected] or email the parish office at [email protected] to discuss ways in which you would like to contribute. • Acolyte service: Please use our SignUpGenius here. • Special receptions: Please use our SignUpGenius here. There are many different ways in which your financial gift supports St. John’s. 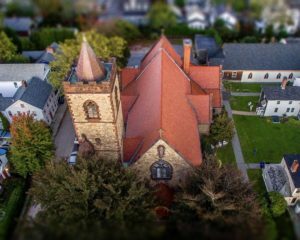 From the General Fund, to restoration of our historic 1894 Hook & Hastings Organ, much-needed capital repairs or improvements, and helping those in need in the community, you can choose what you would like to support. All donations are tax-deductible; a giving statement will be provided at the end of the year for income tax purposes for payments made through Realm or by check. Other donation acknowledgements may be provided by your financial institution or by request. • Make a pledge: You can make a pledge to St. John the Evangelist at any time by using our online pledge card, here, and at the bottom of this page. This form does not require you to disclose any financial information – it is simply the electronic version of a traditional pledge card. • One-time online gift: To give a one-time gift online without an account, click here. • Other online gifts: To set up recurring online payments through our secure parish database, Realm, you can register for a new account here. If you already have a Realm account, you can log in here. You can give a one-time gift with a Realm account as well. • Automated Payments: Check with your local financial institution’s billpay services to set up automated payments to St. John’s. • Sunday offering: Every Sunday “we offer our selves, our souls and bodies” to God, in the words of the Communion prayer. At the offertory, we demonstrate our gratitude to God in support of St. John’s through our offerings. Simply place your offering in the plate during the service. If you are paying with a check, or do not need a record of your giving, an envelope is not necessary. •Mail your gift: You can mail in a gift at any time by sending your check to the address below. Please write in the memo line if you would like to put your gift toward a specific cause, such as in memory of someone, to our general fund, or to our organ restoration.